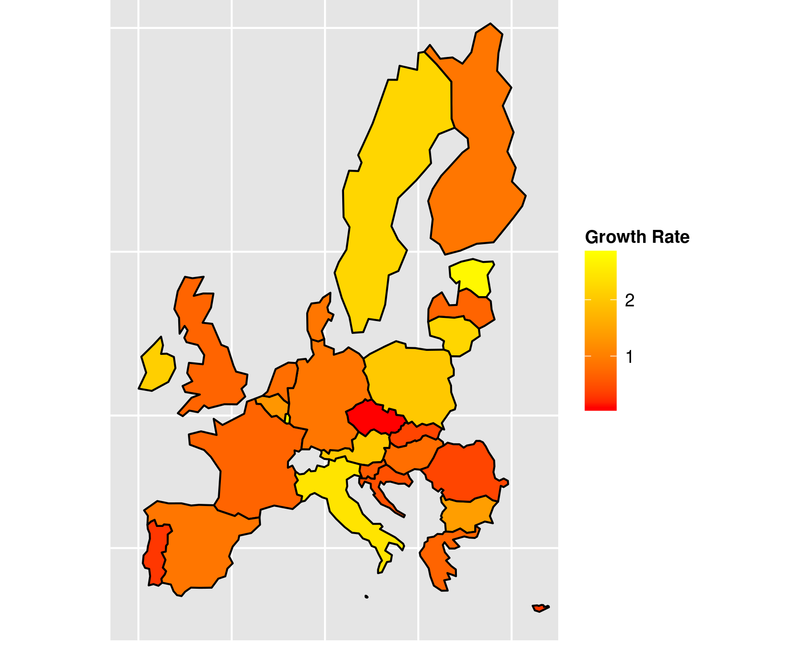 In this post, I will present a way to plot a European Union map using R. We ran across this question with @gVermandel. EDIT (2013-02-18) : As mentioned in the comment section below, there is a nice package I wasn’t aware of, that does (with more ease and offering a more beautiful result) the same thing: https://github.com/briatte/kmaps. As you know, some countries are missing in the maps package. So, instead of working with that package, we will use the rworldmap one, available on CRAN. We will also need two more packages : ggplot2 and grid. First, let’s get the coordinates of every countries from the getMap function. We need the names of the 28 member states of the E.U..
# Select only the index of states member of the E.U. Then we can get the coordinates for each country. # Extract longitude and latitude border's coordinates of members states of E.U. For the purpose of this example, we’ll assign some random values to each country. Finally, we can plot the map. Oh why, thank you! I’ll edit my post to mention your package! Are you aware of any R package that includes historic European boundaries, hopefully going back to the medieval period? Sorry for the long delay and the answer: I do not. Maybe you can work with these data: https://github.com/kgjenkins/tq-world-historical-boundaries.